Apple might have a great-sounding new smart speaker coming out later this year – but, as it turns out, so does Google. 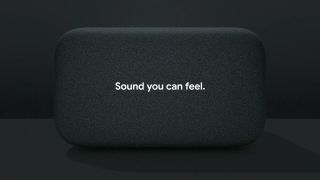 The Google Home Max was announced at the company’s Google Pixel 2 event held on October 4 with one basic premise – Google wants to create a great, powerful sound that adapts to its environment. The speaker packs in two custom 0.7-inch tweeters and two 4.5-inch dual-excursion woofers into a large chassis. Google claims that these drivers will help the Home Max drive its sound throughout the room. Of course, music isn’t the only application for a smart speaker and with devices like the Max and the original Home also being used for podcasts, audiobooks and voice calling as well. To that end, the speaker comes with a new technology called Smart Sound that raises and lowers volume contextually to match your environment. The example given on stage was to imagine turning on a dishwasher. Instead of asking Google Assistant to turn up the music so it can be heard over the sound of the machine, the AI inside the Home Max will dynamically adjust the sound to make it more audible. The Google Home Max will launch in December of this year for $399 (about £300, AU$500) – first in the US and then come to other countries around the world – and will come with a free 12-month subscription to YouTube Red.